If he can’t bottle up the anemic San Francisco offense, Juan Castillo deserves to be fired posthaste. That’s what I wrote just two days ago. And after the defense’s wretched performance in the second half against the 49ers, it’s time to end this farce. 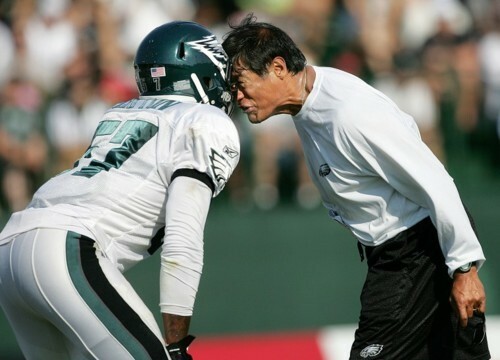 Look, Castillo is not and has never been the only problem on the 2011 Eagles. Dropped passes, missed opportunities, bad playcalling, turnovers, inadequate rookies. You can spread that 1-3 blame around pretty easily. But there is simply no denying that the Juan Castillo Experiment™ is over. The results are impossible to ignore. Three straight fourth quarter leads blown. Career high passer ratings for the last two mediocre quarterbacks to visit the Linc. An incompetent run defense rivaled only by a routinely torched pass defense. Some people (at least as of a few days ago) still put the blame on the players. And, heck, the players certainly blame themselves. But let me explain to you exactly why it’s Castillo, not the players, who’s at fault. Let’s start by traveling back in time about 10 months, when Andy Reid kicked Sean McDermott to the curb. I don’t think there were many people who disagreed with that move. The Eagles defense had disappointed for two straight seasons and McDermott had lost the respect of the locker room. That defense also had major personnel holes. Neither Ellis Hobbs nor Dimitri Patterson were quality NFL starting cornerbacks. Ernie Sims played like a shark out of water. Stewart Bradley was similarly, if not quite so hopelessly inept in the middle. And there was not a single pass rushing threat outside of Trent Cole. 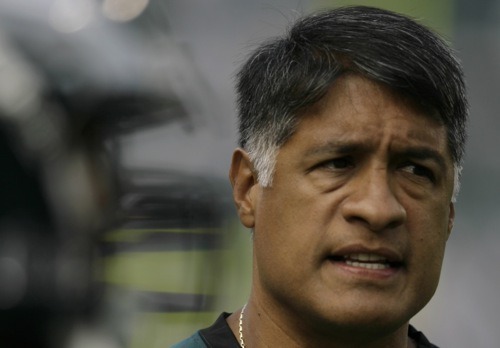 Ultimately, the Eagles decided to overhaul both the players and the coaching. They let Sims, Patterson, Bradley, Bunkley, and Mikell walk. In their place they brought in Pro Bowlers Jason Babin, Cullen Jenkins, Dominique Rodgers-Cromartie, and Nnamdi Asomuga. McDermott was fired, along with the rest of the defensive staff. Reid brought in Jim Washburn to install a new defensive line scheme and Castillo to oversee it all. After four games, we can see what was evident in the preseason: the defense continues to have major personnel issues. The linebackers, even slightly improved with Brian Rolle subbing for Casey Matthews, remain a work in progress. Jarrad Page leads a revolving door of subpar safeties. Still, overall you can’t look at this defense and say that the talent isn’t significantly better than the one McDermott managed to a 10-6 record last year. Castillo has more to work with, but has done less than the man he replaced. He has so far been completely unable to scheme around and protect his weaker starters. There is zero evidence of adjustments as the games go on, causing second half leads to disappear faster than full sentences at a Reid losing game press conference. Even worse, Catillo’s schemes have actually mitigated the strengths of some of his best players. Look at Asomugha. This is a player who’s one of the top two or three man-to-man press cover cornerbacks in the NFL. When they call his number to match up one on one against Roddy White or Hakeem Nicks or Vernon Davis, he shuts them down. That’s what the $60 million contract was for. But frequently Castillo asks Asomugha to drop back into zone coverage, give the wide receiver a big cushion, or go all the way back into a free safety spot. Quite simply, that hasn’t worked. In today’s game, for example, Asomugha was playing zone on an Alex Smith rollout pass in the third quarter. Nnamdi was sucked out of position to his left, allowing Kendall Hunter to break free for a 44 yard gain. It was ugly, but foreseeable. A good defensive coordinator finds ways to maximize the talents and minimize the weaknesses of his players. Furthermore, Castillo’s main message all offseason was a return to fundamentals. Supposedly he was going to re-instill a basic attacking defense that lets the players play without overthinking. After all the missed tackles and blown assignments, it’s clear that he can’t even deliver on that promise. Castillo may be a great motivator for his players. But he’s bringing little else to the table. His promotion didn’t make sense at the time, and after an offseason and a quarter of the season gone, Castillo still hasn’t done anything to change our minds. Time to fire him while you still might be able to salvage the defense. Tagged with Philadelphia Eagles, NFL, Juan Castillo, Andy Reid, Defense, Defensive Coordinator, Sean McDermott, Linebackers, Safeties, Cornerbacks, Defensive Line, Coaching. October 2, 2011 by Brian Solomon.